Common butterbur takes its name from the practice (prior to the invention of refrigeration) of wrapping butter in its leaves to preserve the butter for longer. It thus solved a problem in the old days; nowadays, it's more likely to be considered problematic. Learn why it presents a challenge and how to overcome it. Plant taxonomy classifies common butterbur as Petasites hybridus. There's a variegated type bearing the cultivar name, Variegatus. It's classified botanically as an herbaceous perennial in the aster family. It gets its genus name, Petasites, comes from the Greek, petasos (felt hat worn by shepherds) because the leaves are so big they could function as hats. This is a robust perennial, topping out at about 3 feet in height, and with a spread of up to 5 feet. Grown primarily as an outdoor foliage plant, the pinkish flowers, nonetheless, offer some interest, mainly because they're among the earliest spring flowers (blooming in April in zone 5). Furthermore, they're rather novel-looking (which is fortunate, considering that they can hardly be called "beautiful"). The actual flowers are tiny, but they're clustered atop a flower stalk that also sports greenish sepals. As sweet a curiosity as the flower is for die-hard plant geeks, though, the average gardener will be more interested in the leaves. 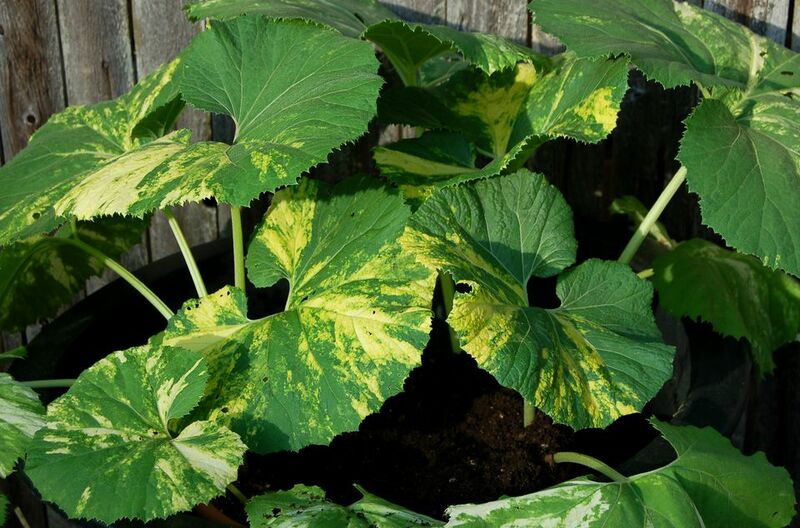 Not only are the heart-shaped leaves large (the biggest can measure 13 inches across), but, on the variegated type (cream and green color combination), they are truly lovely. Indigenous to Europe, the recommended planting zones for common butterbur in North America are 5 to 9. Preferred growing conditions are shade and wet soil. Partial shade is all right (and may be better for the variegated cultivar to achieve its best coloration), as long as it receives sufficient water, but you can also treat it as one of the plants for full shade. Given its huge leaves and cravings for wet soil, an alternate common name, not surprisingly, is "bog rhubarb." The biggest challenge in growing butterbur plants is keeping them from spreading where you don't want them to grow. Propelled by vigorous rhizomes, they're invasive plants whose natural tendency is to colonize. They'll pop up even where you don't want them (if given the right growing conditions) unless carefully contained. To control them, grow them in pots or erect bamboo barriers around them. When given too much sunlight, the leaves will wilt during the middle of a hot summer day. Treat such an occurrence as a red flag indicating that you may have mislocated your common butterburs. There's no need to panic upon seeing this, though, fearing that the plants have died, as they'll revive once the sun goes down. As the summer progresses, the oldest leaves will begin to die (sometimes their stalks are snapped in high winds, as well), but your foliage display will be replenished by the crops of new leaves that continually emerge. Sink a container into the ground near where your butterburs grow. Pour about 2 inches of beer into it. The scent of the beer lures slugs into the container. They fall into the beer and drown. When you cook with eggs, don't throw away the eggshells. Instead, drop them in a pot of boiling water for a couple of minutes (to sterilize them), strain off the water, and put the eggshells in a plastic bag. When you've accumulated a bunch of them, put the bag on the floor and step on it to crush the eggshells down into smaller pieces. Empty these pieces onto the ground around your butterburs. Slugs don't like crawling over jagged edges and will be repelled. Wet the soil around your butterburs and lay a board down on it. Slugs seek cover in damp, shaded spots, so the board acts as a trap. Next morning, look under the board. If you find any slugs, scoop them up and dump them in a pail of boiling water to kill them. Common butterbur is related to coltsfoot (Tussilago farfara). You may well be familiar with what coltsfoot looks like without actually ever having identified it and attached a name to it. This wildflower is one of the first to bloom in spring. Unless you've studied wild plants, you may well think of it as "some sort of dandelion" when you see it in flower. However, it blooms well before the dandelions; moreover, unlike with dandelions, the flower precedes the appearance of any foliage. While the leaves of coltsfoot are tardy in appearing in spring, they make up for it later in the year, when they take center stage. The common name derives from the shape of this foliage. These leaves, by late summer, are large enough to attract notice from anyone who pays attention to wild plants when walking out in the woods. The common name, "sweet coltsfoot," is sometimes applied to common butterbur. Butterbur was even listed as being in the same genus in the past when it was known botanically as Tussilago petasites. In terms of landscape design, it's easy to exploit this perennial's coarse plant texture to form interesting contrasts with other plants. Group it with plants tolerant of the same growing conditions that exhibit a finer texture, such as meadow rue, to create sharp textural contrasts. Variegated common butterbur makes a magnificent specimen plant for container gardens.